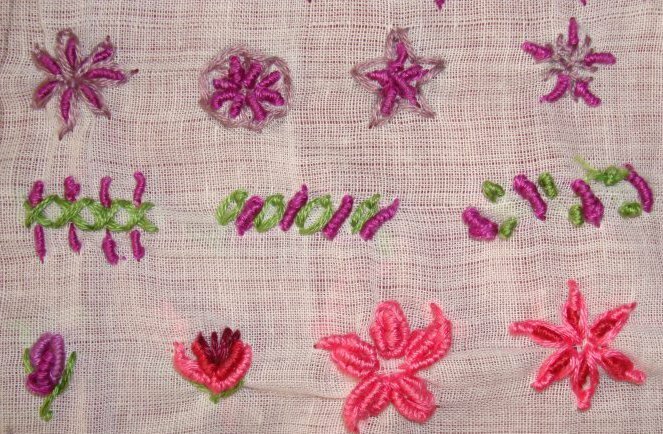 15. a few fly stitches were worked, in between bullion knots were worked in mauve thread. 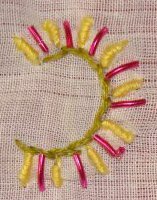 16. a circle of straight stitches, and bullion knots worked in between them. 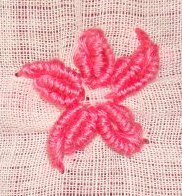 17. the first one, Cretan stitch was worked in a circle, bullion knots were worked in two colours on them. The next one, I worked back stitch in a curved pattern on one side, and bullion knots on the other side. 18. Tried bullion knots in two shades of green. 19. worked bullion knots and added some zardosi tubes in between the knots. 20. in this I tried some flowers and leaves with bullion knot. This bullion knot is not my friendly stitch, I could say. Still I was eager to try this stitch for this challenge. But I am also happy that it is completed now. In this week’s TAST challenge, the non co-operative bullion knot is worked as florals. 4. the bullion knot is outlined with detached chain stitch. 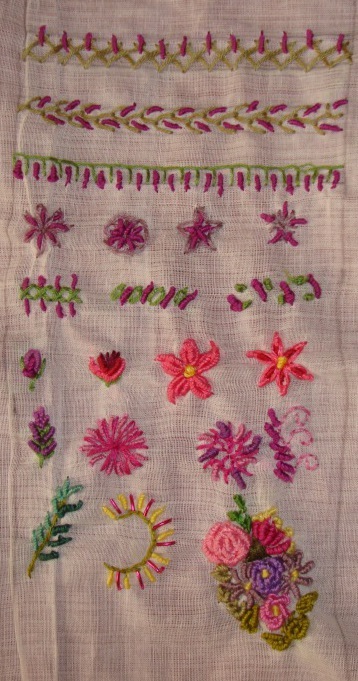 5.the outlining is done with buttonhole in this motif. 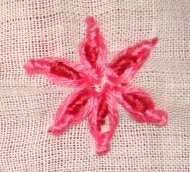 6. the star shape if done in back stitch. 7.the base of bullion knot is worked in fly stitch. 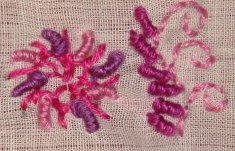 8.bullion knots are worked on both sides of cross stitch. 9. detached chain stitches and bullion knots are combined together to form a border. 10. this line , the uncontrolled bullion knot with French knots! 11. The idea for this variation is taken from a book. 12. another attempt to do a flower with this bullion knot. 13. 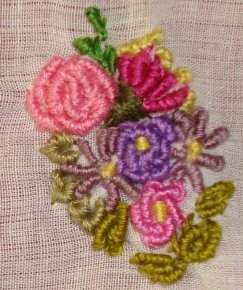 A flower with petals done in three bullion knots of varying size. Really adventurous of me! 14.the small bullion knots are outlined with bullion detached chain. This week’s TAST 2012 challenge is bullion knot. I am scared of this stitch, I have started it only to give up. This time around , there is no escaping from this stitch. After browsing what other people have done with this stitch, I am more scared now. The first idea is to work this stitch with some line stitches, this way I can practice this stitch . so herring bone stitch, feather stitch and buttonhole stitches were the chosen ones. 1. Herringbone stitch- after working a variation of herringbone stitch, I worked [tried] bullion with ten wraps over them. 2.feather stitch- the bullion knots are worked with eight wraps on this row. I’ ll have think of some more use of this knot with other stitches, so that I can make a bullion knot trying sampler!